Located in the village of Laxey, on the eastern coast of the Isle of Man, the restored railway runs along the surface section of the tramway which once carried lead and zinc ores from deep inside the Great Laxey Mine. The railway’s terminus is located at the Valley Gardens which was once the site of the Great Laxey Mine’s Washing Floors. Passengers travel in a tiny carriage, hauled by a replica of one of the original steam engines, through the Island’s only railway tunnel and along the line which once carried wagons loaded with the metal ores. At the Mines Yard terminus of the railway, a series of information boards explain the surviving mining features. The Laxey Wheel, the Lady Isabella, is just a short walk away from the terminus. Built in 1854 to pump floodwater from the mine, it is the largest working waterwheel in the world and is the Island’s most visited tourist attraction. In 2006, the former Snaefell Mine waterwheel was restored to working order on the Valley Gardens. No other railway can boast of a waterwheel at each end! Please take a few minutes to look at the various pages of the website which explain the history of the Great Laxey Mine, the mine railway, how it was restored, its rolling stock and operating days and much more. The Links tab also offers you a path to our facebook page with current photographs of work and events being carried out by the volunteers. The Great Laxey Mine Railway is owned by the Laxey and Lonan Heritage Trust, a registered Manx Charity, which was formed in 1997 to promote the rich industrial and natural histories of Laxey Village and Lonan Parish. 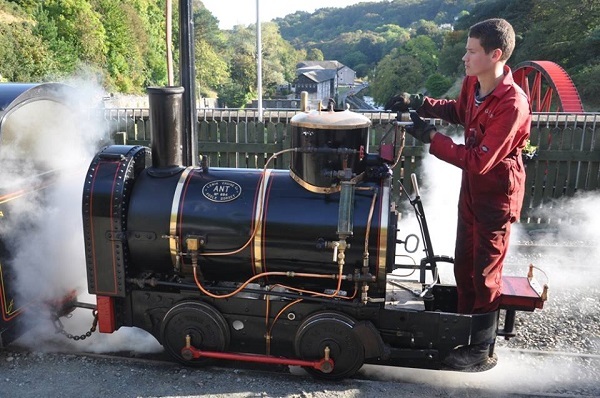 The railway is operated and maintained entirely by volunteers from the Laxey and Lonan Heritage Trust. Britain’s Great Little Railways Ltd. Registered in England & Wales – Company No. 3143331.